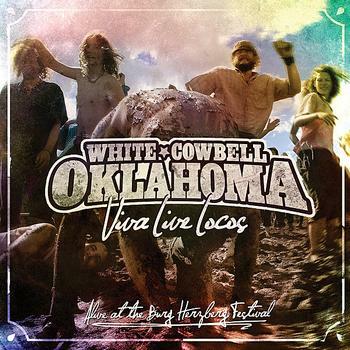 White Cowbell Okalahoma - "Viva Live Locos: Alive at the Burg Herzberg Festival"
As the title suggests this Canadian big band of southern rock inspired rock and roll was recorded live at the amazing Burg Herzberg Festival in 2006. The CD features a lot of fun, mostly high energy tracks in 72 minutes. The CD starts off with three uptempo party rock and roll numbers with a lot of humor, especially the track Put the South in Your Mouth. Despite the band having many guitar players, there are very few guitar solos at the beginning but they warm up a bit and start to include some solos with Tear You a New One. On Ole Glory, they try to get a sort of southern religious thing going. Faster Than Sin, is a quick 3 min song. Fly Away they introduce as a country number but it really is not much of a country track. Monster Railroad is a high speed rocker with this crazy chainsaw guy making some spaced out sounds as the band keeps a steady rocking groove going with some nice duelling guitars. Do Me So Wrong is a pretty damn cool boogie rock track that starts pretty slowly but really picks up with a lot of guitar solos at the end. I should say there is quite a bit of cool organ playing on the early tracks and then I guess he switches to guitar as he is not playing on most of these last many tracks. Now they go into a boogie rock thing that lasts 13 mins and includes two tracks, Shot a Gamblin Man and Magic Fingers and now the organ returns. They end this pretty cool concert with the classic, I Just Want to Make Love to You. It is not as good as the Foghat version though…..